Origami Ornaments is based on the design of traditional Japanese Kusudama ceremonial spheres. But the Japanese designs regularly require the use of glue to hold several parts together. Lew Rozelle has designed four basic models – base, joiner, clip, and hinge – which can be folded together, hanging in lovely globe or lantern shapes, thus remaining true to origami purist standards. Folded out of colorful paper, the ornaments can be made small enough to hang on a Christmas tree or large enough to hold aromatic potpourri. As the ornaments rest they will open gently, like flowers, but still not come apart. Also included are instructions for incorporating string for hanging as well as tassels into the design – a lovely finishing touch. There are no limits to the number of unique ornaments you can make from the four basic models. Try using various wrapping paper patterns and colored paper – the possibilities are endless. 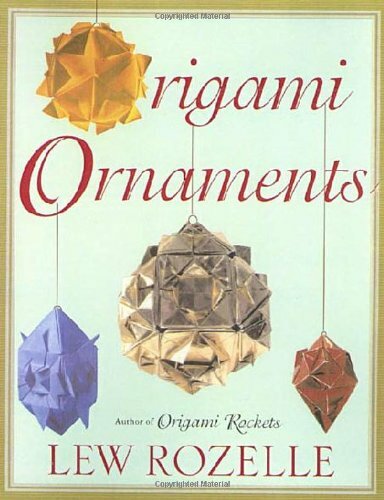 Origami Ornaments is the perfect book for holiday crafters and origami enthusiasts alike.